Organize, Store And Potect Your Most Valuable Tools And Materials With These Quality Double Wall Storage Cabinets. Rugged, all welded, 18-gauge steel construction will provide years of service in both factory and office environments. Each shelf is easily adjustable and carries a 500 lb. load capacity. Double wall cabinet doors feature full length piano hinges and a lockable flush mounted door handle for obstruction free, finger tip operation. 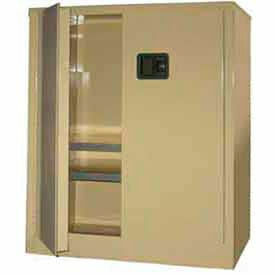 3-point self-latching doors add even more convenient security. Shipped fully assembled and ready to use.